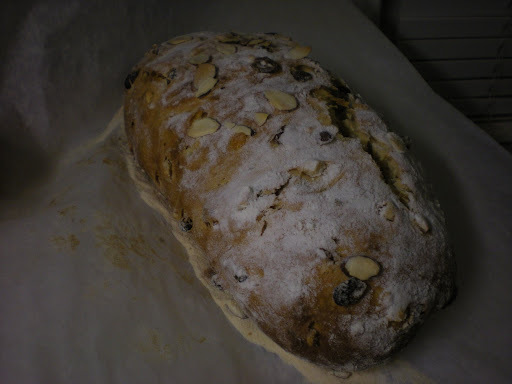 Last week I promised to post instructions about stollen. Since I am all about keeping promises (except for volkornbrot, which seems to be lost to the winds of time), here it is. I wanted to keep experimenting because there were some things I thought could be improved, but as it is I like this recipe a lot. That said, there are some things that could be improved. For example, the ingredients are originally measured in volume, not weight, which wastes an awful lot of dishes and measuring tools. Second, it needs more flour than called for. 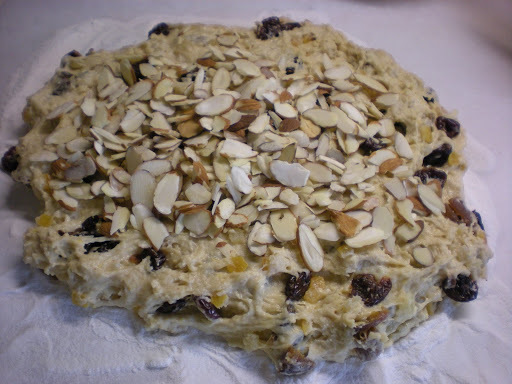 I also like shaping it differently once the almonds are added. Finally, I don’t decorate this baby with anything but the rice flour it was baked in! 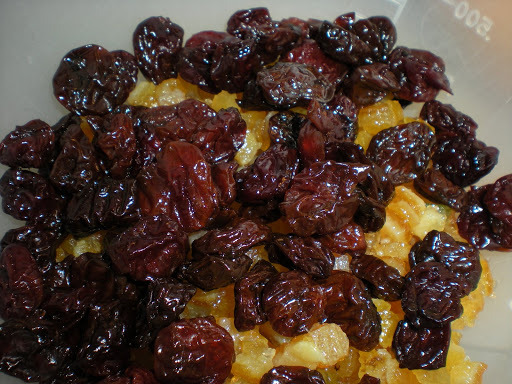 2 cups dried fruit. 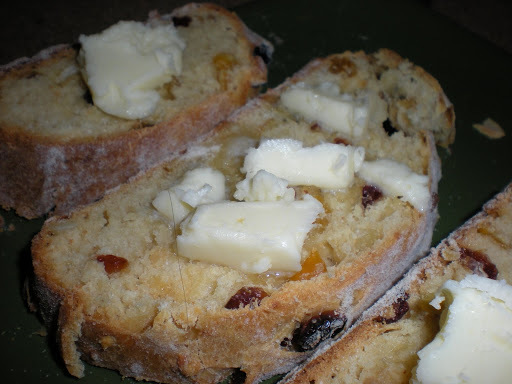 I used candied orange and lemon, dried apricots, and cherries. Zest from one lemon or about 1 tbl orange zest. 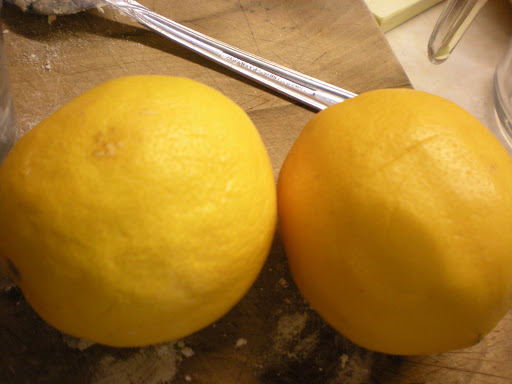 Last time I used grapefruit zest and this time I used lemon zest. 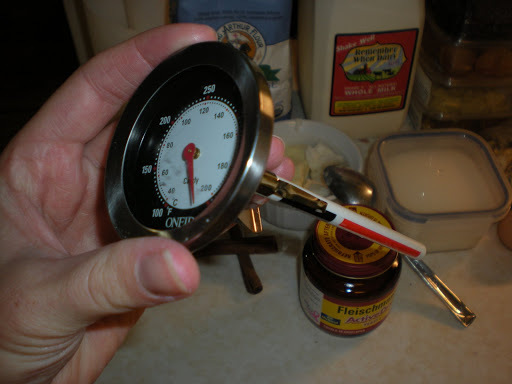 You don’t really need a thermometer but I’m starting to like using it. You need it twice in this recipe. 1. 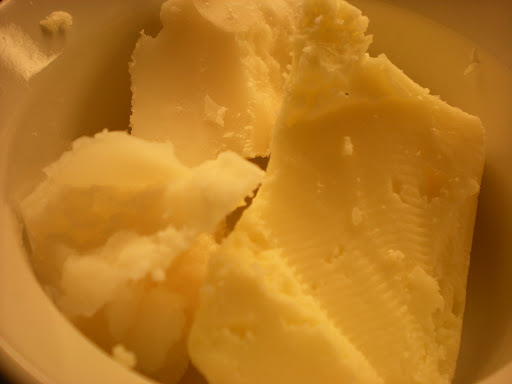 Before you do anything else, set out the egg and the butter/lard to soften. 2. Now, measure out the milk and heat it in a saucepan to 100 degrees. Here is the first time you will want your thermometer. 100 degrees is slightly warm, but NOT hot. You don’t want to kill the yeast. Now pour in the yeast. 3. 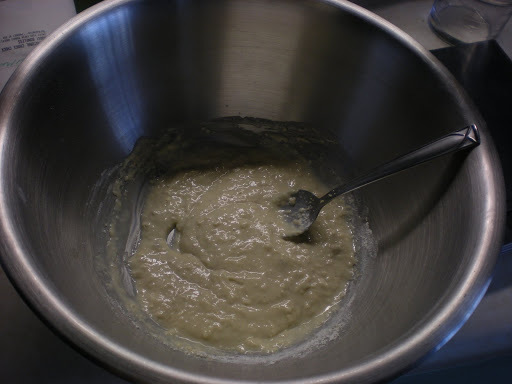 Pour the yeast and milk into a small mixing bowl with the flour. Cover with plastic wrap and let ferment one hour. 4. 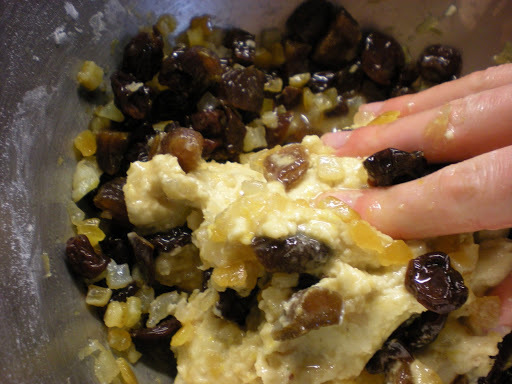 While you are waiting on the sponge, combine the fruit, zest and brandy in a bowl or large measuring cup. The sponge should be really bubbly after about an hour. 5. When the sponge is ready (don’t throw away the plastic wrap! 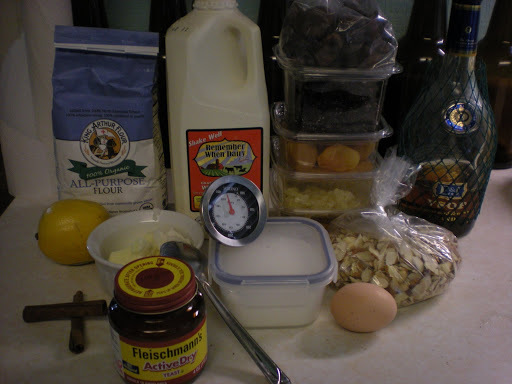 ), combine the remaining flour, salt, sugar and cinnamon in a large bowl. Add the sponge, egg, softened butter, and a few tablespoons of the water. 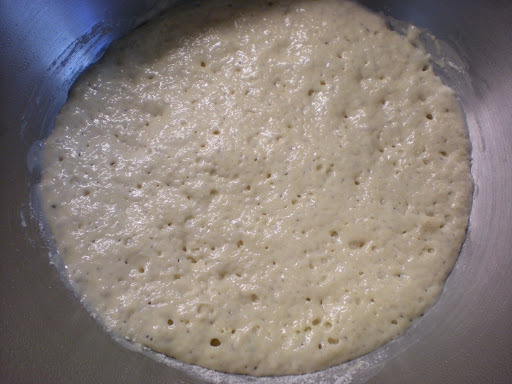 You want to form a soft but not sticky dough. Also, since you are going to be adding the brandy soon, it’s better if it’s slightly dry. 6. Now here is the part I hate. It involves bringing everything together. 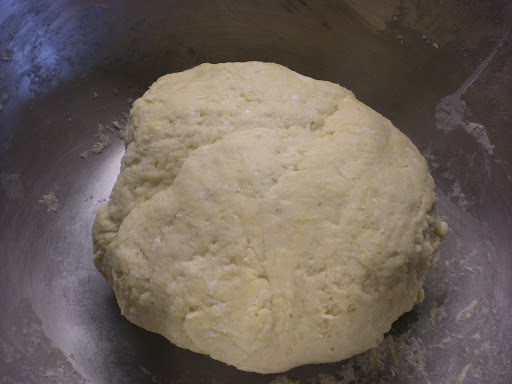 The reason I hate it is because the dough gets really slimy and hard to work with. I also add a few handfuls of flour because it’s so wet. 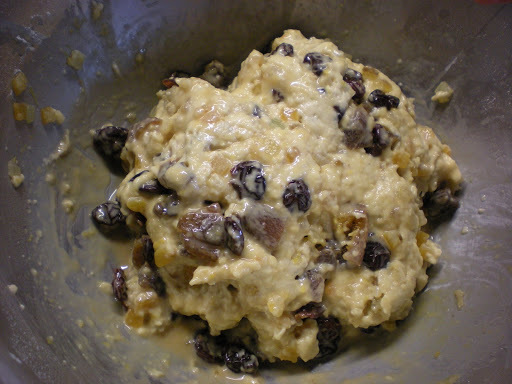 I want to find out if I can just add the brandy first and then if the dough needs more moisture add the water. 7. 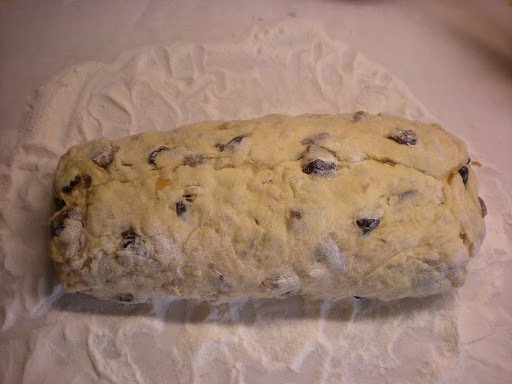 Once it is all incorporated, cover it with the plastic wrap from the sponge and let rise about an hour. 8. Take a sheet of parchment paper and dust it with rice flour. 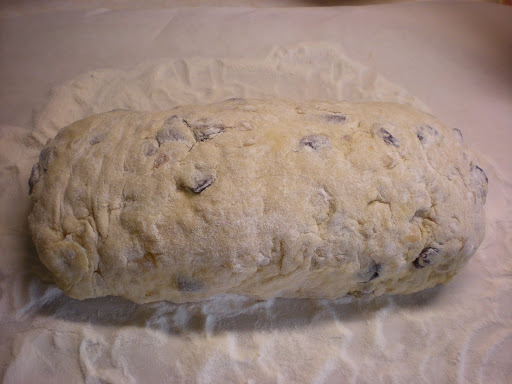 Take your dough and stretch it a little bit in your hands before setting it down on the parchment. Continue stretching until it is in the shape of a rectangle. 9. Now pour the almond slivers over the top. 10. Take the top and bottom edges and gently fold them until they meet in the middle over the almonds. Press the edges together to form a seam. 11. Now take the whole thing and flip it over so the seam-side is down. Gently even up the edges. Now cover with plastic wrap and a towel and let rise again for about an hour. 12. Now preheat the oven to 350. Transfer the parchment paper to a cookie sheet and put in the oven or put the parchment paper directly onto a pizza stone. Bake 20 minutes, then rotate and bake until the internal temperature is about 180-190 degrees. This takes another 20-30 minutes. 13. 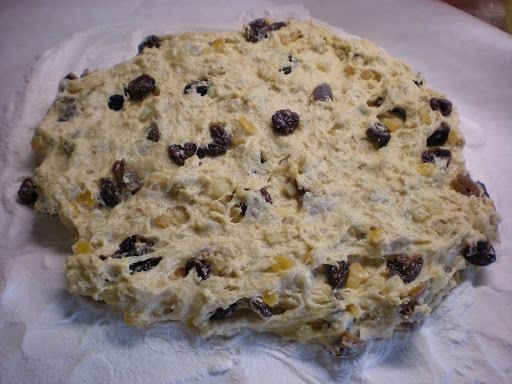 Remove the stollen from the oven and let cool before slicing. It tastes amazing with butter. To store it, wrap it in parchment paper and secure it with a rubber band, then store in a paper bag. They give you lemons from their grandfather’s orchard in California!